The men who founded the University of Warwick, including the first Vice Chancellor, Jack Butterworth, seventh from right. The year is 1968. Warwick is entering its fourth year, with its first demonstration – against the presence of the U.S. ambassador in 1967 – behind it, and growing agitation on campus around Vietnam, South Africa and the poor state of social facilities for students. 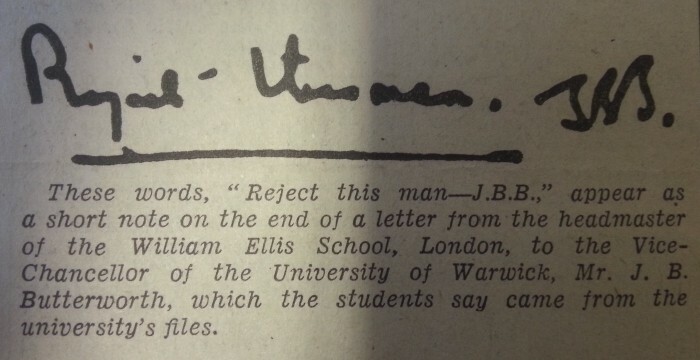 From a newspaper report on the words of the first Vice Chancellor, Jack Butterworth, who rejected an applicant to Warwick for political reasons. Unbeknownst to the rest of its small population, Warwick’s paranoid management are privately discussing the political activity of its staff and students. Management, local councillors and police keep in close contact regarding the presence of Warwick students distributing an anti-authoritarian leaflet outside a local school. A headmaster sends Warwick a warning that one of his pupils – who has applied for a place at the University – is worryingly politically active. Warwick management thank him for the information, and promptly reject the student at the personal request of the Vice Chancellor. All this, and much more, was uncovered by students occupying the administrative building on February 11, 1970.2 They found systematic evidence of political spying by Warwick’s management, in collusion with business owners who sat on Warwick’s Council. Such collusion went as far as discussing possibilities for removing politically-active academics. David Montgomery, a visiting American academic who was spied on at the bequest of members of Warwick’s Council. 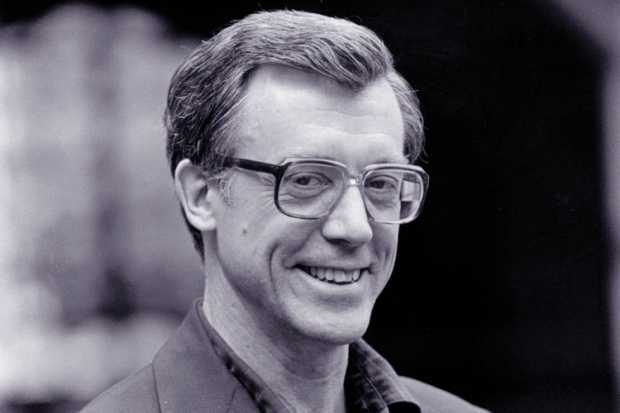 Such “difficult” staff included David Montgomery, a radical American academic visiting Warwick in the 1970s. He was spied on by a corporate mole whilst addressing local trade unionists in Coventry. 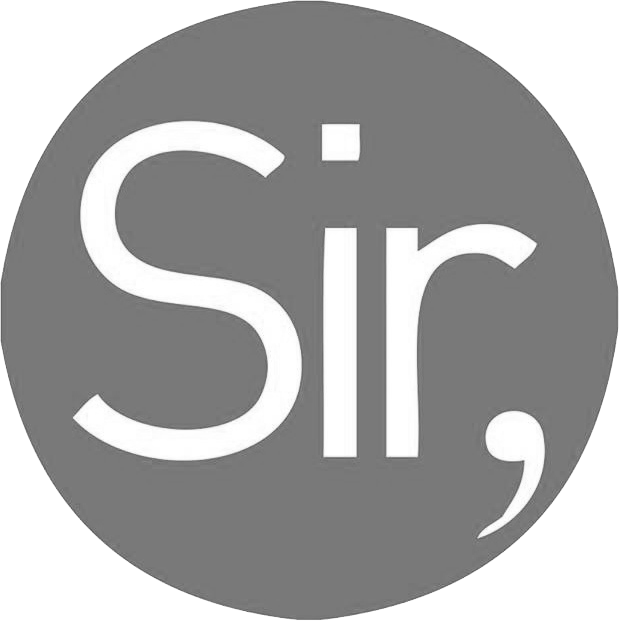 The report on the meeting was circulated around Warwick’s senior management, and the University’s legal advisor commented on whether Montgomery might be deported under the Alien Restrictions Act, an obscure WW1-era anti-espionage law. In short: radical academics were causing Warwick’s management a severe headache, and the protections laid down in the University’s statutes – such as Statute 24 – were holding management back from firing these pesky staff members. Today, for the first time in Warwick’s history, the University is removing these employment protections from statute. The ‘good cause’ protection which management mentioned in the 1968 letter is currently in Statute 24. Under the recently proposed reforms, such protections will be removed from Statute 24 – and moved to low-level policy, which can be subsequently changed at any point by management with no oversight or resistance. This sordid history of political manoeuvring by Warwick’s management – and the clear statement from the upper echelons of the University that the only thing holding them back from untrammelled political dismissals was statutory employment protections like Statute 24 – should make it obvious why management are trying to remove these protections today. If they succeed, we can expect a range of dubious dismissals in the coming years. Warwick UCU, the academic staff union, have launched a campaign to stop the reforms to Statute 24. Indeed, Thomas Docherty, the English professor and outspoken critic of the neo-liberal university who was suspended for nine months in 2014 for “projecting negative body language, making ‘ironic’ comments and sighing during interviews”, told the Warwick Globalist that he would have lost his job permanently if the current changes to Statute 24 had been in place. These historical revelations make the bitter, desperate warnings of a range of departments in recent weeks regarding the reforms sound all the more chilling. The History Department have described the changes as a “severe curtailment of our academic freedom”. 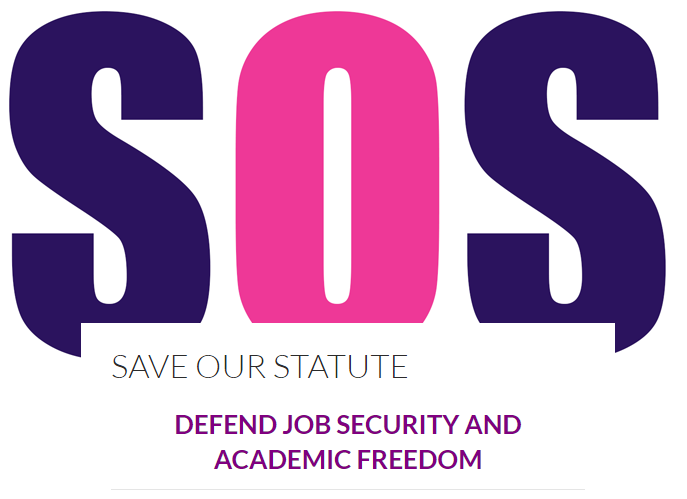 The Institute for Employment Research have argued that the reforms “will result in a curtailment of academic freedom and [are] likely to lead to short term thinking and groupthink.” Warwick Law School declared that the gutting of Statute 24 “infringes upon academic freedom and the intellectual independence of our profession”. Such warnings are prescient. Salford University, which underwent a similar statutory reform around 2006, was subsequently hit by 13 waves of job cuts. Warwick’s history of political surveillance adds even more weight to the growing chorus of voices urging management to stop the reforms – or for students and staff to force them to stop. The question remains whether these warnings will be viewed by the eye of history as prophetic but futile attempts to raise the alarm as Warwick plunges into the abyss; or whether they will be seen as the rallying calls of the campaign which saved academic freedom at Warwick. What the eye of history will see, is still up for us to decide. 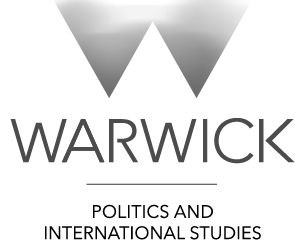 You can find a full analysis of the proposed Statute 24 reforms at Warwick here. You can find out more about how to get involved with the campaign to save Statute 24 here.